Common cold is the world’s most common ailment. Probably, there is no one in this wide world who has not suffered from this illness at least once in his / her lifetime. It’s so common that the name “common cold” is so very apt. · This disease is not caused by cold weather or by getting drenched in the rain. If it was so then Eskimos would have cold permanently. 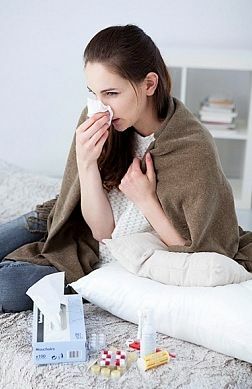 · Cold is caused by the invasion of the nose by a group of viruses called “rhino viruses"
· Like all other infections, common cold is caught from an already infected person. · It’s a misconception that alcohol intake cures the cold. It might to some extent reduce the uneasiness of the sufferer but alcohol can never kill the virus responsible for the ailment. · There is no direct relation between weather and cold. The reason why common colds could be common in winters or in monsoons is that people tend to stay indoors which makes the virus spread easily. Apart from this, a dry nose in winter is also vulnerable to viral attacks. Also viruses thrive and multiply well in cold, humid and wet climates. Also read this. · There are no effective drugs to kill the viruses that cause the cold. There are only remedies to relieve the symptoms of cold. · Common cold misery ends in 7-10 days because by that time the body generates enough antibodies to destroy the viruses. · Women tend to suffer more cold than men. · Since the immune system of smokers is weak, smokers tend to get more prolonged cold frequently. · People under stress are also more likely to catch a cold. This proves that stress weakens the immune system and makes our body vulnerable to diseases. · Interestingly, introverts get more severe cold than extroverts.